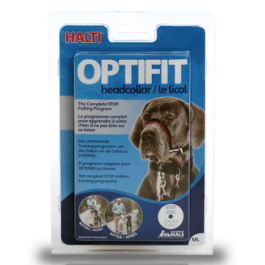 The HALTI OptiFit is a premium headcollar designed by Dr. Roger Mugford to provide an optimum fit and which guarantees to stop your dog pulling. The HALTI OptiFit is the complete STOP PULLING program. Its unique design works by gently directing the dogs head, steering him into desired positions just like a horse. The pack includes a HALTI OptiFit Headcollar, a comprehensive Training DVD and Guide and a HALTI safety link which connects to the dogs’ collar for extra security. With a self-adjusting chin strap and unique, reflective cheek straps which follow the contours of a dogs face, the OptiFit doesn’t rise into the dogs eyes or slide down to his lips (flews). Designed to fit dogs that other headcollars don’t - from short nosed Boxers to long nosed Greyhounds, the OptiFit provides maximum comfort and optimum fit no matter what shape or size. Suitable for small breeds such as Jack Russel and Border terrier.